We offer semiprivate 55 minute classes limited to 7 people. Why not book a private session to focus on your individual goals? Or bring a friend/s for a duet/trio/quad session! How about a CrossCore® Party! 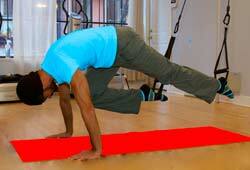 CrossCore® adds rotational movement to all your favorite body-weight training exercises. Similar to TRX with the addition of a pulley that insures that you work BOTH sides of your body and won’t let you compensate with your stronger side. Core De Vie instructors bring the unique integration of the spiraling and core strength benefits of Gyrotonic®, Pilates, Power Plate and Personal Training into their CrossCore® training sessions. We offer both private training and group classes.You’ll get a GREAT workout and have a ball at the same time.